Reviewed by Niall Power and Mary de Paor. 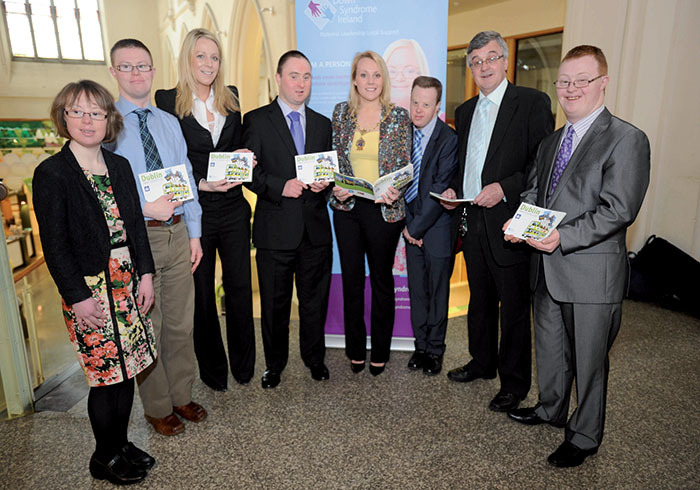 Down Syndrome Ireland (DSI) has published an 82-page guide to Dublin, funded under the Gruntvig Lifelong Learning Programme of the European Commission. The guide is designed for persons with special needs—but it can also be useful for any city visitor. 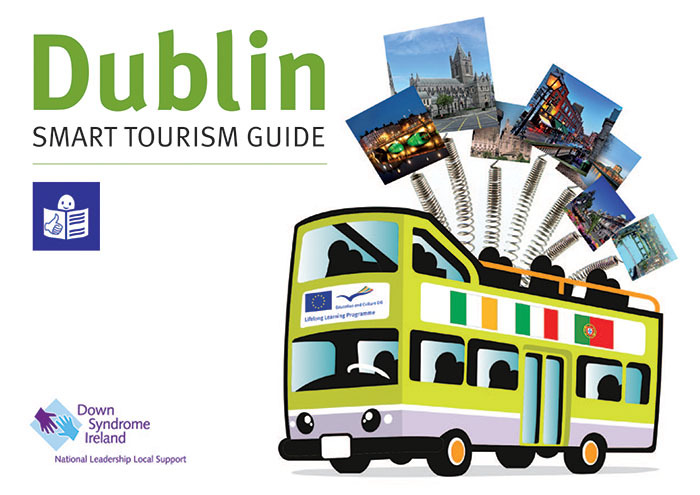 Twelve members of the DSI’s National Advisory Council devised the Dublin Smart Tourism Guide in the spring of 2013, in the same format as similar guides to Rome (by members of the Associazione Italiana Persone Down) and Lisbon (by members of the Associação Portuguesa de Portadores de Trissomia 21). The guides cover the city geography and history, with maps and information on transport, suggestions on where to eat and sleep, things to see and do, and self-guided walking tours. I’m really interested in public transport and it was good to have maps for the DART and LUAS. But the LUAS map didn’t have the extensions to Saggart and Cherrywood. They didn’t say that you have to use coins (and the right fare) on Dublin buses. That can be hard for people if they don’t know it—and that you can get a change refund at Dublin Bus HQ. The guide gives the internet sites for most kinds of transport, but not for Aircoach, which has a lot of routes. It might be good to say what bus numbers go to the ‘top 10 things you must see, if there is a new edition of the guide. And they could mention the free Dublin Bus app for smart phones. I’m glad Croke Park was in the list of places to go. They could have said lots more about the GAA—and Dublin Football! Mary’s comments: The Irish traditional foods list was very good. Maybe they could have mentioned where to find them on the menu (like Gallagher’s Boxty House). Phone numbers might be useful for the hotels and some of the places to visit. It’s hard to put so many centuries of history into just a few pages; I missed a sentence about pre-Viking Baile Átha Cliath, and the Great Famine, rather than plagues. The ‘ten top things you must see’ were well chosen and interesting. The National Museum of Ireland entry (p.51) refers only to the Natural History Museum, with no information about the other two parts of the national museum collection elsewhere. The ‘live’ zoo is in the ‘having fun’ section, along with hop-on-hop-off bus tours, which were also in the transport section. The authors also suggested visitors might like to go greyhound racing, and to the National Leprechaun Museum. The two walking routes were very good, but a little confusing, with the map for Walk Two coming before the description of Walk One, and vice versa. The authors of the guide suggested two good tours outside Dublin, to Co. Wicklow and Kilkenny. And we enjoyed the ‘notes from the editors’ at the end of the guide, giving their personal recommendations. The National Advisory Council members now have an additional qualification—as Dublin City Guides! Niall has suggested there might be a second edition of the Dublin Smart Tourism Guide—and we think it would make an excellent free App. Niall’s dad and I visited Lisbon in February. I had downloaded the Lisbon Smart Tourism Guide (in English!) and found it very useful. It seems a pity that the Dublin guide is only available in English—not translated for our Italian and Portuguese visitors. Any volunteers?